NOTE: Here are excerpts from the “executive summary” of the report from Ocean Alliance on the results of their unprecedented five-year survey of global ocean toxicity, publicly released in June of 2010 just before the BP disaster in the Gulf of Mexico. In my on-going effort to get the real and total picture of what’s happening, I’ve given OA some “constructive criticism” which I hope didn’t offend anyone, for example, suggesting that, since they are already looking for POP’s, toxic metals, and nano-particles, why not complete the spectrum of toxicity by looking for radioactive substances. I also suggested that, like Rosalind Peterson of www.agriculturaldefensecoalition.org, they identify the military, specifically, the U.S. Navy, as prime suspects not only for their toxic chemical contributions, including the “new kid on the block” chromium, but also for their extensive global deployment of LFAS, “low-frequency active sonar” which can explode the inner ears of cetaceans within a “kill zone” the size of Texas; and the Air Force has been spraying a lot of toxic chemicals for “geo-engineering” purposes, too, which, like almost all pesticides used on the planet, end up in the ocean. As it stands now, the military, a monstrous planetary juggernaut, is categorically exempt from any environmental regulations whatsoever. They are the proverbial “elephant in the living room” that almost everyone pretends not to see. But the dung is piling up. By the time our nostrils are clogged, we won’t be able to speak out! I also only half-jokingly asked Ocean Alliance if they had paid the whales any royalties for use of their “songs”, and if they were whales, would they in fact want to be “sampled” or even “watched.” Without ever mentioning it, I was wondering if they were at least considering the possibility of becoming vegetarians, if for no other reason than the bio-accumulation of toxins in the flesh of sea animals (and yes, contrary to an on-going belief still held by some, fish is in fact meat. It’s certainly not a vegetable, what else could it be?) Finally, Iain paid me what is by far the highest compliment anyone has ever offered. In closing our most recent phone conversation, he said “Stay sane.” The implication is that in his eyes I WAS sane. And also by implication, humanity as a whole might not be. In the interest of the preservation of “sanity” and our love of the Earth and her oceans, I present to you now a summary of the recent Ocean Alliance voyage. NOTE: Soon I will be posting a comprehensive synthesis the current global cetacean scenario. Ocean Alliance, Inc., a 501(c)3 organization, was founded in 1971 by biologist Roger Payne. Led by Dr. Payne and CEO Iain Kerr, Ocean Alliance collects a broad spectrum of data on whales and ocean life relating particularly to toxicology, bioacoustics, behavior, and genetics. Working from that data, we give information about ocean pollution and the health of marine mammals and other ocean life to policy makers, politicians, nongovernmental organizations, educators, and students. Our data is the basis of many conservation success stories. Our major scientific partner is the Wise Laboratory of Environmental and Genetic Toxicology, at the University of Southern Maine, which conducts state-of-the-art research aimed at understanding how environmental contaminants affect the health of humans and marine animals. The Wise Laboratory’s mission is accomplished through the pursuit of a number of key objectives, including innovative and multidisciplinary research in toxicology and molecular epidemiology to increase understanding of disease in humans and marine organisms, particularly in relation to cancer, asthma, and reproductive/developmental effects. We learned to track sperm whales day and night by listening for the vocalizations they make. We towed an array of underwater microphones (called hydrophones) behind the Odyssey at all times. The sounds the hydrophones pick up are then broadcast inside the pilot house and displayed visually through a computer program invented by Douglas Gillespie of the International Fund for Animal Welfare. The program, called Rainbow Click, assigns a different color to the clicks of each different sperm whale, determines a bearing to them, and displays those clicks without ocean noise, enabling us to find and follow the individual whale. The crew of the Odyssey has become so skilled at doing this that if we hear just one “click train,” we can almost always find the group, and having done so, we can stay with it for days as long as at least one of the whales in the group keeps clicking. calving grounds in Argentine waters since 1970. Ocean Alliance is best known for Roger Payne’s 1968 discovery (with Scott McVay) that the intricate and impressive vocalizations produced by humpback whales (Megaptera novaengliae), particularly on their winter assembly grounds, are produced in repeated, rhythmic patterns and are therefore, by definition, songs. Roger Payne and other researchers at Ocean Alliance have gathered recordings from humpback whale populations throughout the world, a collection that now contains more than 1,500 recordings from 14 geographic regions. It may be the largest collection of humpback recordings anywhere and is now being curated by Cornell University’s Macaulay Library of Natural Sounds. The Ocean Alliance library also contains recordings from right whales, sperm whales (Physeter macrocephalus), and several other species, which, together with the humpback recordings, total more than 6,000 hours of sounds. The contamination of the world’s oceans is a rapidly expanding global problem. According to 1998 reports from theU.S. Environmental Protection Agency and the U.N. Environment Programme, between 1930 and 2000, the global production of human-made chemicals increased exponentially from 1 million to 440 million short tons per year. Because the oceans are downhill from everything on earth, they are the final destination for every contaminant that can be moved by water or wind. Poisonous chemicals contaminate ocean food chains throughout the world. Pesticides poison our food and leach into waterways; many industrial emissions poison the air and damage our lungs, kill wildlife, and impair the ability of our children to learn. We are facing a slow graying of the human future caused by the inexorable accumulation of persistent organic pollutants (POPs). Because they are metabolized so slowly POPs increase in concentration as they move up food pyramids. In the 1980s more than 900 dolphins died off the East Coast of the United States from immune system disorders, some of which may have been caused by pollutants in their habitat. In the seemingly crystal-clear water off the Bahamas, Atlantic spotted dolphins (Stenella frontalis) show signs of pox, skin lesions, tumors, and birth defects. Beluga whales (Delphinapterus leucas) in the Gulf of the St. Lawrence river are so full of chemical pollutants that when they die and their bodies wash ashore, they have to be treated as toxic waste. Yet the lack of any baseline data on the concentrations of these substances has made it all but impossible to persuade governments to take the steps necessary to reduce the manufacture, use, and improper disposal of POPs in the environment. The Voyage of the Odyssey program was established to fill this gap and collect the first-ever global dataset on the distribution, concentrations, and effects of toxic pollutants in the world’s oceans. Ocean Alliance has accomplished this by collecting 955 sperm whale tissue samples worldwide. In doing so, we have used sperm whales as our bioassay – as a global indicator of contaminant loading in a top predator. We chose to study sperm whales because they, like us, are top predators – and therefore can be expected to offer an instructive reflection of the problems from contaminants that we also face. We have collected samples from every ocean (including polar oceans because that is where adult males feed), advanced the field of marine mammal toxicology, and created an unrivaled sample set of information and other resources for future collaborative research. The Voyage has made it possible to draw direct comparisons between contaminant concentrations in all oceans, and has provided the first worldwide assessment using the same protocols of the risks facing humans and wildlife from pollutants in the sea. 2. To measure the contaminant burdens present in our samples, especially for EDCs (endocrine-disrupting chemicals) and other persistent organohalogens. Organohalogens (organic molecules with attached halogen atoms such as chlorine or bromine) are part of a greater group of chemicals called persistent organic pollutants (POPs). We chose organohalogens as our initial focus because most are synthetic chemicals that are pervasive, and have potential toxic effects such as immunosuppression, disruption of neurological functions, reproductive abnormalities, and cancer. Also, POPs accumulate in fatty tissues (e.g., blubber), which makes measuring them in skin/blubber biopsies feasible and practical. Furthermore, as they play no known positive physiological role in animals, the presence of most organohalogens in animal cells indicates that the animal has been exposed to industrial chemicals. The principal organohalogens that we targeted for study are recognized toxicants and include DDT, DDE, dioxin, and several PCBs (polychlorinated biphenyls). Although the toxicity of these substances was well established by others prior to our Voyage, the extent to which they had reached into the marine environment was unknown. It was to document their concentrations near-shore as well as in remote ocean regions that Ocean Alliance launched the Voyage of the Odyssey. About the time that the Voyage was drawing to a close, we began to recognize a new and impending threat from an even more ubiquitous suite of organohalogens, the polybrominated diphenyl ethers or PBDEs. These compounds are used as flame retardants and are now found worldwide in many consumer products. Structurally, they are very similar to PCBs except that the halogen atom is a bromine instead of a chlorine. Near the end of the Voyage, studies by others began to emerge showing that concentrations of PBDEs were dramatically increasing in human mothers’ breast milk, particularly in U.S. mothers. There were also disturbing reports that these substances may be neurotoxic to a developing brain. Because we had waited until the end of the Voyage to settle on what compounds to analyze, Ocean Alliance was able to shift its principal focus on organohalogens to these key and newly recognized toxic PBDEs, the distribution of which are virtually unknown. Regulation is now coming into place for the more familiar toxicants such as PCBs while PBDEs are mostly unregulated. As the Voyage neared its end, Ocean Alliance’s partner Dr. John Wise of the Wise Laboratory of Environmental and Genetic Toxicology at the University of Southern Maine, was fully engaged in the analysis of our samples. Dr. Wise and his team are pioneers in marine toxicology. Their studies include an emphasis on the toxic effects of chemicals in cells grown in culture. This means that not only are we able to establish baseline concentrations of pollutants in the sea, but we now can measure directly the toxic effects of the pollutant concentrations we observed on sperm whale cells grown in culture. This will provide a toxicity context to our measured baseline of pollutants. The latter step will occur later, but for now, under Dr. Wise’s leadership, we are continuing to analyze the pollutant concentrations in the samples we brought back from the Voyage. Halogens are nonmetal elements consisting of fluorine, chlorine, bromine, iodine, and astatine. An organohalogen is a chemical that has a halogen as part of a molecule the remainder of which is carbon based. In environmental toxicology, perhaps the most infamous organohalogens are the organochlorines. These carbon-based chemicals have at least one covalently bound chlorine atom. Their principal uses are as solvents, pesticides, and electrical insulators. In our study, we focused on three groups of them: polychlorinated biphenyls (PCBs), which were used primarily as electrical insulators, DDT and hexachlorobenzene (HCB). The latter two are pesticides. What Samples Did We Use? The PCB, DDT, and HCB analysis was done by Dr. Cristina Fossi at the University of Sienna in Italy. 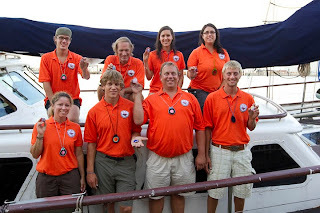 The Fossi study included 50 individual whales that we selected on the basis of their CYP1A1 levels (discussed later). They came from five Pacific Ocean regions (10 individual samples per region). Because of the potential high cost of organic contaminant analysis and our desire to rapidly achieve a global dataset reflecting pollutant levels in the whales, we chose to measure the levels of CYP1A1 in whale biopsies. The chief scientist of the Voyage at the time, Celine Godard-Codding, also had a specific research interest in this biomarker. See full report for results. Polybrominated diphenyl ethers (PBDEs) are organohalogens that are structurally like PCBs, except that instead of chlorines, they have bromines. PBDEs are predominantly used as flame retardants in many products including clothes, furniture, electronics, cars, plastic packaging, and building materials. The health effects of these compounds are just being established. The most common concern focuses on their potential for affecting the developing nervous system and possibly for disrupting the endocrine system. What Are Toxic Metals and Why Should We Care about Them? Toxic metals are metals that poison the body and have no known biological role. As a group they can poison all of the organ systems of the body, though individually the scope of their toxicity is, in most cases, more limited. Some of their organic forms (such as methylmercury or tetraethyl lead) are even more toxic than they are as elements, but others (such as arsenobetaine) are less toxic. Because toxic metals are elements, they cannot be destroyed, although they can bioaccumulate, and some biomagnify. One aspect of toxic metals is that they can mimic essential metals and interfere with the uptake or function of that essential metal. For example, cadmium, lead, and other toxic metals can interfere with the uptake of iron and cause iron deficiency. Chromium is one toxic metal that can be either toxic or essential. In its hexavalent form, it is clearly a toxic metal. In its trivalent form, it is classified as an essential metal; however, more recent data are challenging that classification and finding that although it may have activity as a drug, it may not be essential. Chromium is currently unique among essential metals in that it is the only one for which there is no recognized disease state that results from its deficiency. The absence of such a state further supports the argument that although it has pharmacological activity it may not have essential activity. We have included it here with the toxic metals because with the levels we find – whether in its trivalent or hexavalent form– there is reason for concern. Although we measured all toxic metals, the full report presents the baselines and some brief context with respect to the uses and health effects of chromium, mercury, aluminum, arsenic, cadmium, lead, gold, silver, and titanium. We also provide the context of other published studies of sperm whales, other whales, and other marine mammals. We are still in the process of reviewing existing literature studies, but we have summarized what we have found so far. We have yet to find data for some pollutants, suggesting that ours may be the first. Of course, there may be publications that we have not yet uncovered, and new data are being reported all the time. Thus, contextualizing our data is an ongoing process, and we will be expanding it to include the remainder of the toxic metals we measured (barium, strontium, and tin) as well as the essential metals such as copper, iron, magnesium, manganese, nickel, zinc, and selenium. This summary focuses on chromium, mercury and selenium. Our study was one of the very few to measure levels in free-ranging, apparently healthy whales, and thus of necessity we measured skin levels. The other studies considered dead animals and usually focused on the liver and other internal organs. They rarely considered skin, and therefore some of the differences in levels that we found may be due to the difference in organs studied. We discuss the overall implications of these data later in this summary (also see page 152 of the full report). Our context is presented later as we discuss each ocean and sea separately. A finer breakdown of locations beyond major oceans and seas can be found in the individual metals sections. Implications of the Data: What Does All of This Mean? As evidenced by the many contaminant baseline concentrations presented in Part 3 of this report, we achieved our fundamental goal many times over. We can now talk and think about many pollutants in a global context, something not possible before the Voyage. This context is critically important because it allows us to see in objective terms that even animals living in the most remote ocean regions are heavily contaminated and that pollution is now a global problem. Voyage of the Odyssey results encourage us to begin thinking more about global movements of pollutants by such natural forces as wind and ocean currents. Scientists have long questioned whether pollutants were moving across the globe at rates and concentrations that would constitute any kind of significant threat to ocean life or, by extension, to human life. But the baseline concentrations provided in this report now show that this is indeed the case. The presence of high levels of pollutants in remote locations near areas of land without major industry such as Kiribati and the Galapagos demonstrate that contaminants are everywhere whether they are carried there by wind, water, or animals. We now have proof that humanity is polluting all oceans. In the future, the baselines provided by the first Voyage of the Odyssey will tell us whether things are getting better or worse and in applicable cases whether remediation efforts are working. The Voyage of the Odyssey transforms the way we will think about contaminant studies. The study encompassed hundreds of apparently healthy animals of a single species that is found across the globe. It is the first of its kind. Even if we consider studies of dead animals, it is the largest single marine contaminant study. Previous studies have relied on small numbers of animals, usually a handful, from just one species. Moreover, these animals were usually found stranded and dead, though in a few cases, such as subsistence-hunted bowhead whales, the specimen animals were presumed healthy when they were killed. and may now seek with greater confidence of possible success, new ways to perform larger and more ambitious studies. With the dataset from the Voyage we now have the statistical power to show marine baselines with unprecedented authority. Critics of previous studies by others have pointed out that the number of animals considered was so low that the studies probably did not reflect the whole population of that species, and disputed that any definite conclusion could be drawn regarding a large pollution problem. In addition, they argued that because the studied animals were sick, the levels were quite probably elevated as a result of the underlying disease that caused the animals to strand and die in the first place. Finally, they argued that if there were any validity to the levels found, they probably reflected an unusually high and localized exposure to some rare pollution event such as an oil spill or a sunken ship. The Voyage of the Odyssey overcomes all of these criticisms. Hundreds of animals were considered, not just a handful. Because all of the animals were alive and exhibiting normal healthy behaviors, disease is not likely to be a factor, nor is it likely to be responsible for the elevated levels found. Eighteen broad regions from around the globe were studied so this is not merely a local phenomenon. Moreover, the vast majority of sperm whales are not found in coastal waters so this is not just a near shore problem. Finally, because this work was done on a single species, critics cannot argue that the observed differences come from studying several different species. Because of the dataset we have provided, it is no longer possible to argue that marine pollution is not a major global health concern. Very few studies have considered contaminants in the Indian Ocean. This data gap seems remarkable given the size of the Indian Ocean and the numbers of peoples who depend on seafood from it. The Voyage of the Odyssey has now provided substantial insights into pollution levels in the Indian Ocean, which will help officials and scientists in that area better understand the challenges they face in protecting and conserving this important area. The high aluminum and chromium levels we discovered are surprising and provocative. Aluminum and chromium have only rarely been considered in marine studies as they were not thought to be major concerns. Now, with data showing chromium levels previously seen only in workers, with long occupational exposure, the discussion changes and we have to consider aluminum and chromium as important global health concerns. One discussion we have already started concerns the possibility that whales are exposed to chromium via inhalation. This argument stems from the fact that chromium is poorly absorbed by eating food or via direct absorption through the skin. Thus, it would be logical that in order to have the high levels we observed, whales have to have been inhaling substantial quantities. In starting this discussion, we have learned that few have considered the impact of air pollution on marine mammals, the focus having almost entirely been on diet and water exposure. The Voyage data will fundamentally change the way scientists perceive the marine environment, by forcing them to consider air quality as an important health concern to marine life. The creation of the world’s first sperm whale cell lines will allow us to investigate the toxic effects of metal and chemical pollutants we found in the biopsy samples we obtained. We will also be able to compare the effects of pollutants on sperm whale cell cultures to their effects on human cell cultures, thereby gaining important insights into both whale and human health. Finally, using these cell lines, we can create a number of important cellular and molecular tools that can be used to gain a better understanding of sperm whale biology. Nanotechnology is an unstoppable wave of the future that has raised concerns globally about its strong potential to cause serious environmental problems. Because of the Voyage of the Odyssey, we are now armed with key baseline data showing levels of three of the major nanomaterials (silver, gold, and titanium) before they came into widespread usage. As that usage grows, our results will help assess the effects of the widespread use of nanoparticles on the marine environment, and can be expected to be of key value in helping to minimize negative effects. Although the levels of organochlorines in the oceans are low, the Pacific baseline for these chemicals tells us that they appear to be decreasing. This observation is important because it tells us whether remediation methods such as banning a chemical can work – an important consideration when considering how to control other pollutants with very high levels, such as chromium. PBDEs are a ubiquitous contaminant of emerging concern. Once we complete the work of establishing the baseline for them, we will have provided a key insight into the extent of their reach into the oceans and how urgent a problem they constitute there. There are of course many more important but less consequential achievements from the Voyage that we will not attempt to discuss further here. Examples are the data showing that chromium can damage whale DNA and the determination that CYP1A1 is not a sufficient biomarker for assessing contaminant exposure levels in sperm whales. As we continue to analyze our samples, we are confident that many more discoveries will come to light.